Comments Formed in the heart of seas, nurtured in coolness of waters, filled with calm radiance and quiet elegance is what natural pearls are. 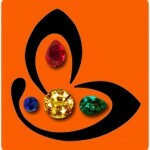 It is an organic gem that is beautiful and exudes charm. 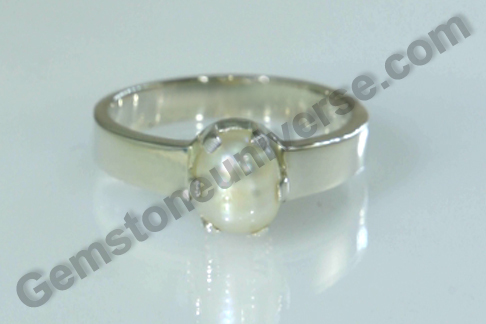 Featured today is a splendid natural Pearl from Australia of 2.45 carats, set in sterling silver as a Moon Talisman ring. The pearl is a button shaped, smooth white in color with a pale rose overtone. It is a fully natural and organic pearl and comes with certification and radiography report. Natural pearl also known as Moti or Mukta in Hindi is the gemstone of Moon/ Chandra graha and is used to harness its energies. The Moon is perhaps the most influential planet for human beings as it is the significator of the mind and all mind related issues. If the mind functions at its optimum, an individual is able to handle almost any challenge in life. It is always suggested to ask for natural pearl certification and radiography report for Natural pearl for there is a glut of cultured pearls in the markets and the latter do not have any value what so ever for planetary gem therapy.